mmsonline.com November 2017 MMS 93 FEATURE Large-screen displays can do more than show data. Advance Machine, a FactoryWiz Monitoring user, reinforces the message that everyone is part of a team working toward the same goal. data from machine monitoring. One was a renewed focus on process improvements, especially as a result of more precisely targeted lean manufactur- ing techniques such as setup reduction and "next-job readiness." The other prong was making the shop's profit-sharing incentive program more ef fective. Mr. Hosmon said that the resulting data-driven performance reviews and correspond- ing payout policies were a big part of the effort Mr. Shortess led at Advanced. Here are some additional observations and advice gleaned from this shop's experiences: • Build benchmarks and set goals around attainable improvements linked to customer, company and personal benefits. Each employee should see how good decisions help everyone and maximize rewards. • Foster dialogue, and keep it positive. Asking "How can we work together to help you do better where the facts show room for improvement?" should start this dialog. • When addressing an individual's shortcom- ings, use data to ask the right questions and get the real reasons. Good data protects everyone and defuses the blame game. • Let shopfloor visibility generate some healthy competition among employees. Keeping score should reflect that everybody can win. • Don't let data-driven incentive programs get stale. Review goals and adjust the performance targets often. A GATEWAY TO INDUSTRY 4.0 I wrapped up the session by pointing out that machine-monitoring systems are af fordable, manageable and likely to have a quick payback. I noted that most companies see a 10- to 20-per- cent uptick in productivity just by having perfor- mance data visible to the workforce. 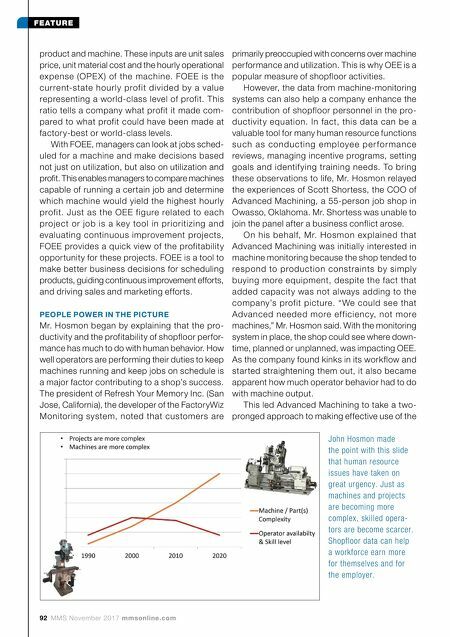 More impor- tantly, once a machine-monitoring infrastructure and shop culture are in place, manufacturing companies can easily move to other opportunities for connecting machines and processes so data can be shared and responded to automatically. For example, self-correcting feedback loops linking machine tools, measuring equipment and programming software become practical. Likewise, it will be possible to predict and prevent downtime due to component failures or maintenance issues. Data-driven manufacturing represents a sweep- ing advance for manufacturers. It's no wonder it's being called the fourth Industrial Revolution or Industr y 4.0. I'm convinced that machine monitoring is the gateway to this new world. 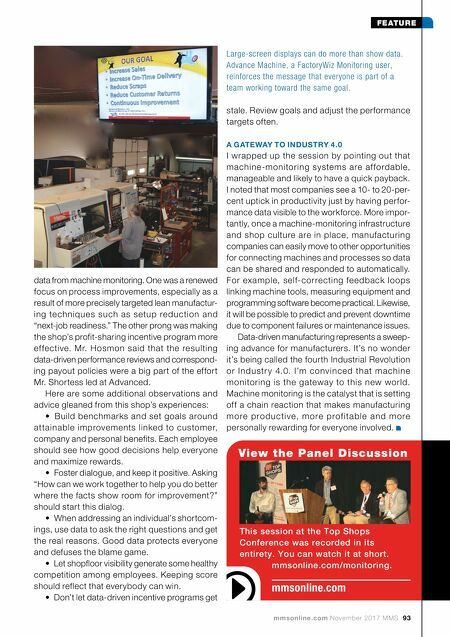 Machine monitoring is the catalyst that is setting off a chain reaction that makes manufacturing more producti ve, more prof ita ble a nd more personally rewarding for everyone involved. View the Panel Discussion mmsonline.com This session at the Top Shops Conference was recorded in its entirety. You can watch it at short. mmsonline.com/monitoring.